Many thanks to everyone who braved the weather and turned up for the annual Etsy Made Local Market held this year in Bristol in City Hall on College Green. Having lived in Bristol for a number of years I still can’t believe this was the first time I’d ever been into City Hall! The beautiful high ceiling space was filled with local designer makers, 60 different sellers showcasing their work each day over the weekend. I was so impressed with the curation of the range of work by the Bristol Etsy Team, everything fitted together perfectly to make one large giant pop up market of gorgeous lustworthy gifts. As well as selling my jewellery I picked up a couple of gorgeous ceramic art pieces by Bird Can Fox (a snake and a pink shell dish), a giant massive roll out poster by Dixon does Doodles and brooches from Little Paisley Designs. My assistant on the day, Beth, had a mid-afternoon spend-a-thon with Nellies Treasures gorgeous children’s wall hangings and Victoria Williams covetable earrings. We could have easily spent a lot more, but these were just gifts for ourselves! I also am delighted with my beautiful blooms on my stall created by the lovely Lucy Coco Floristry. Lucy created gorgeous vintage pastel posies for me, hand tied in glass jars and even added in my favourite things at the moment, dried flowers. I loved meeting you all and thank you for coming to support myself and the Etsy Bristol community. In this world where we are overwhelmed with buying choices I’m always grateful when someone chooses to support my small business. So thank you again, it does mean a lot to me to be able to keep making and dreaming up new ideas. What a wonderful weekend, it’s a shame it was all over so soon! Roll on next year’s Etsy Made Local market in Bristol. I will no doubt be popping up somewhere else very shortly to sell in person, updates will be here on the blog. New jewellery pieces have hit the shop this week and I’m thrilled to finally have two of my most popular necklaces in a different colourway. Little bee charms and monstera leaves in silver tone are up for grabs now in the shop - although my run this time is limited online! If you’re joining me at the Etsy Made Local market in Bristol on Saturday 1st December, I will have a few of these special necklaces available too. I’m excited to be popping up with the beautiful gift store Meggie’s in Stow-on-the-Wold very soon. Come and see me in store hand making your personalised initial silver jewellery orders, especially for you, in the heart of Stow-on-the-Wold. Meggie’s is a treasure trove of gorgeous gifts, stationery, homeware and beauty, all carefully selected and sourced by Meg. Supporting independent and handmade businesses is a big part of Meggie’s, showcased through a rotation of unique workshops and popups each month featuring local artists and designers. Be sure to check out their Facebook page to see what events are coming up next. I’m delighted to be popping up on Saturday 24th November from 12 noon to 4pm to make personalised jewellery gifts in store. 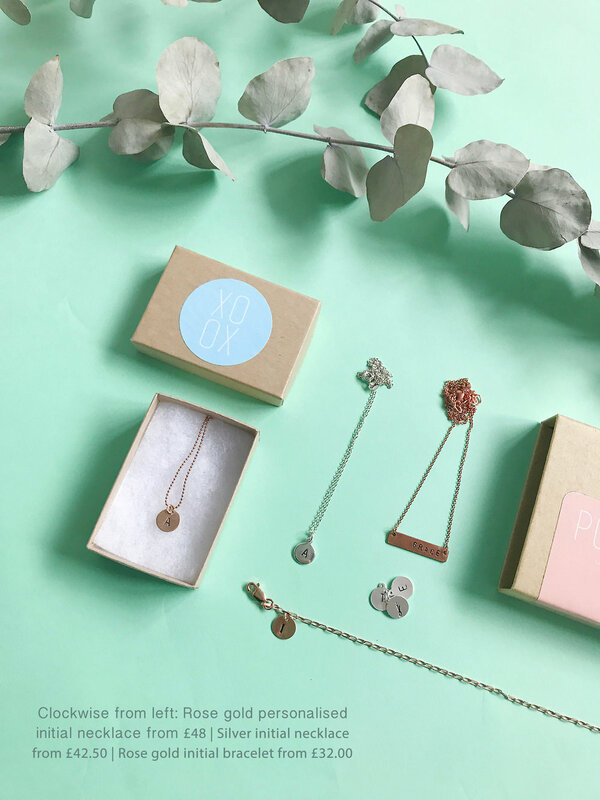 Choose your initials to be hand stamped onto silver or rose gold to make beautiful keepsake accessories for gifting, or as a treat for yourself. Come and buy from me in person on Saturday 1st December 2018 at the Bristol Etsy Made Local Market. This is your only opportunity to buy from my range in Bristol this festive season, along with 50 other local independent Etsy designers and makers. City Hall on College Green is a historic landmark right in the heart of Bristol’s centre, sitting at the bottom of the famous Park Street. Doors will open at 10am for the Etsy Made Local Market, a unique shopping event giving you the chance to buy gorgeous gifts from independent local brands and stores. From 10am to 1pm my silver personalisation station will be open, any personalised silver initial orders placed in this time will be made for you while you wait. This is an exclusive service I’ll be offering only at Etsy Made Local on Saturday 1st December from 10am to 1pm. Or do you fancy making your own necklace? Join me at the Etsy Made Local Market workshop area at 2pm for a workshop to learn how to make your own custom silver initial tag necklace. Tickets are still available through my shop. Hope to see you at this special event in Bristol very soon - let me know if you’re coming by RSVP-ing here. Don’t forget that you can also buy from me in person at my one and only market event with Etsy Made Local Bristol, Saturday 1st December 2018 at City Hall, College Green, Bristol. A one stop shop for all of your Christmas gifts - sounds too good to be true? Bristol's finest independent artisan shops and businesses will be together for one day only to help you solve your Christmas gift list. Head down to the M Shed this Saturday to discover presents and treats from over 50 independent local designers and makers as part of Etsy Made Local 2017. Ranging from ceramics, jewellery, stationery, cards and fashion, this will be a treasure trove of local talent and thoughtfully made pieces that will be sure to delight this Christmas. I've picked out my favourites that you will be able to find at the market this weekend, if you're there quick (I'm sure these will sell out). Bird Can Fox - Recent collaborations with Anthropologie have made her treasures in porcelain and ceramic even more sought after. Be quick to get your paws on one of these beautiful handmade pieces, definitely one you won't want to gift away, keep this for yourself! Little Paisley Designs - Attempt to not buy the whole stall, I dare you. I love Ellie's 2018 calendar and fridge magnets, but to be honest I could easily swipe up everything. Sunshine for Breakfast - Cheerful motivation can be lacking in these winter months. Pep yourself up with some feel good inspirational prints and cards for your work desk. Or gift to someone who needs a little sunshine in their life. Pipistrelle Design - My thing for ceramics runs deep, I can't resist these beautiful porcelain mushrooms. So tactile and even more stunning in real life, the feel of porcelain in your hands really is wonderful. Hello Harriet - Cat and dog lovers rejoice, hand illustrated goodies for your furry pals or pet fans in general. Go crazy for the prettiest pastels, hand lettering and illustrations from Bath based Harriet Gray. 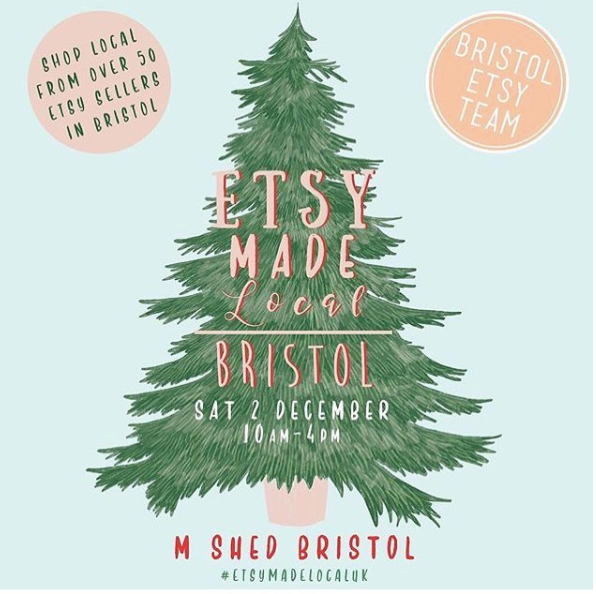 Bristol Etsy Team are hosting Etsy Made Local on 2nd December from 10am to 4pm at M Shed, Wapping Wharf, Bristol. With only 8 weeks until Christmas (yikes! ), it's time to get organised for gift giving. Not sure where to begin? Here's a handy guide to gifting beautiful jewellery with a feel good factor, supporting my small independent business. Oh and gift wrapping is always free with every purchase from Pouss, so that's one less thing for you to to worry about. What are you waiting for, shop by clicking any of the images. Personalised jewellery makes a perfect gift that will be treasured. Using quality materials, each initial is hand stamped by me onto metal of your choice. Choose from beautiful rose gold or sterling silver. 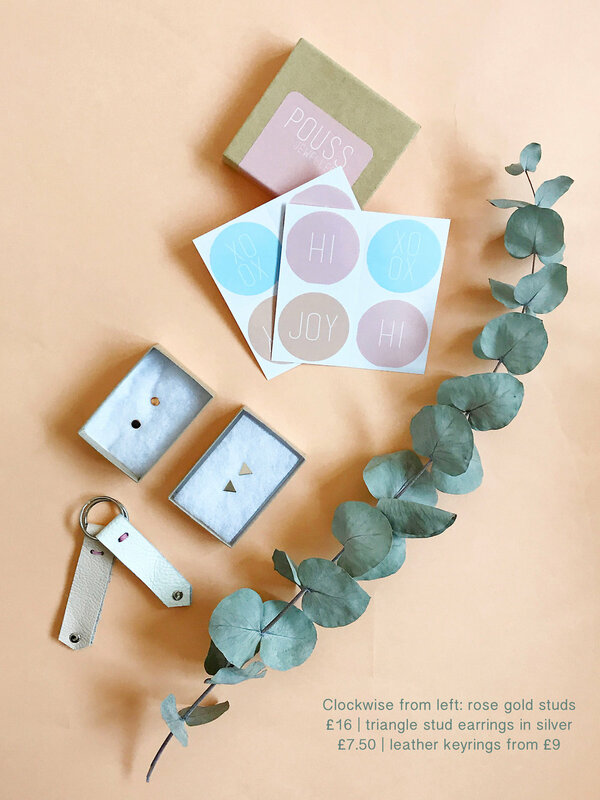 Pouss Design is an accessories and gift brand designed by Amanda Taylor. With a focus on pretty and stylish jewellery and beautifully designed packaging. Made and designed with love in Bristol, UK, each piece comes beautifully git wrapped in signature pastel packaging. Perfect for gifting or a treat for yourself. Amanda is a freelance designer, video producer, Mum to Ray, and has an addiction to reality tv and caffeine. As a supporter of small independent businesses, Amanda previously co-lead the Etsy Bristol team and hosted pop-up shops in Bristol, UK. Follow her creative journey on Instagram and Twitter daily, see inspiration on Pinterest and say hello on Facebook. Sign up below to get the latest news to your inbox. If you're interested wth working with Amanda please send an email using the form below.